Gingrich: There Are No Palestinians! One of the candidates who currently has a very real chance at becoming the next president of the United States could fundamentally alter Middle East peace-making were he to stick to his campaign platform and rhetoric after taking office. In an interview with The Jewish Channel on Friday, former House of Representatives Speaker Newt Gingrich, who has become a surprise Republican presidential front-runner of late, stated that the entire basis of the Israeli-Arab conflict is off because the Palestinians are an "invented people." "Remember, there was no Palestine as a state – (it was) part of the Ottoman Empire. I think we have an invented Palestinian people who are in fact Arabs and historically part of the Arab community and they had the chance to go many places," Gingrich said. Gingrich did qualify his remarks earlier by explaining that he is in favor of a two-state solution to the current conflict, but stressed that it is the Palestinians who must prove they really want peace and compromise on their demands in order to achieve it. During a debate in Des Moines, Iowa a day later, Republican rivals attacked Gingrich over the remarks, but did not go so far as to say he was wrong. "We're going to tell the truth. But we're not going to throw incendiary words into a place which is a boiling pot," said fellow front-runner and former Massachusetts Governor Mitt Romney. Gingrich responded that, like Ronald Reagan, he simply had the courage to say what everyone else knew to be the truth, but were too afraid to articulate themselves. "Somebody ought to have the courage to tell the truth. These people [the Palestinian Authority] are terrorists. It's fundamentally time for somebody to have the guts to stand up and say, 'Enough lying about the Middle East'," said Gingrich. "Reagan believed in the power of truth. I'm a Reaganite, I'm proud to be a Reaganite, I will tell the truth." Gingrich's position echoes that of many Israelis and their supporters around the world who insist that the peace process should be based on historical facts, and not a misplaced crusade for supposed human rights. Archeology over the past century has confirmed to all but historical revisionists that the Jewish connection to this land is both widespread and ancient. Based on that historical knowledge the British Empire that seized control of the Holy Land from the Ottoman Turks promised all of what is today Israel, the "West Bank" and neighboring Jordan for "close Jewish settlement" and the rebirth of a Jewish state. That promise, embodied in the Balfour Declaration, became international law at the San Remo Conference in 1920. At that time, the only persons living in the region who referred to themselves as "Palestinians" were the Jews. And it was the British, not the Arabs, who reinstated that term, borrowing it from earlier conquerors, the Romans, who had taken the name from Israel's ancient enemies, the Philistines, who were not Arab, but of Greek origin. So, Gingrich was correct. In fact, all of the current Arab nationalities are modern inventions (barring perhaps the Egyptians and Syrians - who take their names from more ancient cultures). Prior to the end of World War I, there were no Jordanians, Iraqis, Saudi Arabians or Kuwaitis. And there certainly was no distinct Arab people group known as "Palestinians." The reality that Gingrich clearly has a grasp of is that even the Arab world accepts these truths, as evidenced by the fact that it had no interest in establishing an independent Palestinian Arab state prior to 1967, when the Arabs were in full control of the "West Bank" and Gaza. Nor did the international community seem to care all that much about a Palestinian state in those years. All that changed only when these territories fell into the hands of their ancient, biblical owners, the Jews. 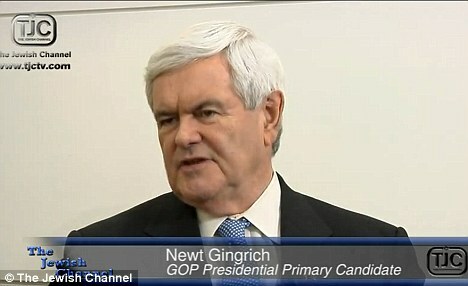 Whether or not Gingrich maintains his current positions should he become president remains to be seen. But the groundwork appears to be laid for an interesting shift in the Middle East peace process should poll numbers remain in his favor.